Once upon a time is the opening line of so many of our favorite childhood books. But there is a real story told every day in Iowa that is not a fairy tale. It is the story of ALICE. She is working (often at more than one job), has income above the Federal Poverty Level, and yet still cannot make ends meet each month. 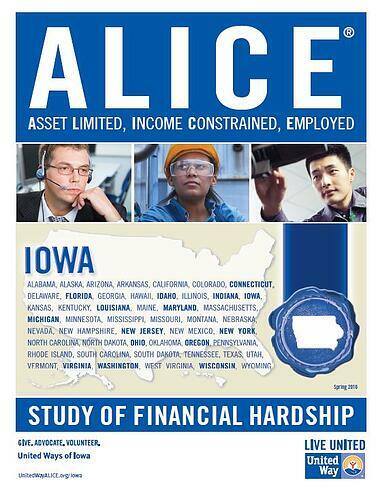 ALICE is an acronym to represent all those in our community who are Asset Limited, Income Constrained, Employed. She is not an individual, but a conceptual blending of all those in our community who bring home a paycheck that doesn’t stretch to cover a household’s needs. The ALICE Report, a joint project of the United Ways in Iowa, tells the real story of those in our communities who are below the ALICE Threshold. Businesses, public officials and community members are well aware that people are struggling in our state. However, they often don’t understand the depths of the struggle, the real fears of these families and the consequences for all of us when we don’t listen to their tale. The ALICE report is a first step in further opening the conversation with a common language to create a new ending for ALICE’s story. Click below to download a PDF of the Executive Summary or the Full Report.